Uniroyal RainSport 3 - The black shark The new RainSport 3 – the latest-generation rain tyres. The new Uniroyal RainSport 3 combines the best of two worlds to set a new standard in wet-weather performance. Its flowoptimised asymmetrical pattern optimally combines the benefits of asymmetrical and directional patterns. The result: maximum protection against aquaplaning as well as optimal grip when cornering and quiet interior noise throughout the tyre’s lifetime. For compact-, middle- and upper-class vehicles and SUVs. Uniroyal offers more than 45 years of rain tyre know-how for optimum performance in the wet. High safety against aquaplaning. 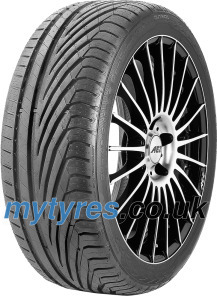 Rated as „recommended“ in the Auto, Motor & Sport summer tyre test 2014 (tested size 205/55 R16 V). It is the best tyre for longitudinal aquaplaning and wet handling. Bionic: high-tech learns a lesson from nature. The Uniroyal RainSport 3 is the first ever tyre to feature the completely new Shark Skin Technology. Uniroyal has transferred the unique flow-optimised quality of sharkskin to the surface structure in the longitudinal grooves of a tyre. Shark Skin Technology minimises turbulence, so that water can be channelled away more quickly – for maximum protection against aquaplaning. High aquaplaning safety Short braking distances High grip when cornering Quiet interior noise High safety against aquaplaning. The new Shark Skin Technology and Ultimate Flow Structure optimise water flow. For the RainSport 3 the shark skin structure has been transferred to the longitudinal grooves of the pattern improving the aquaplaning safety. Short braking distances on wet roads. Numerous grip edges due to a high volume of sipes improve the contact with the road surface. Due to extensive cushioning of the tread compound this leads to short braking distances on wet roads even in high braking situation. High grip when cornering. Fast Curve Configuration provides the shoulder blocks high lateral stiffness for a direct transfer of the side forces. The flexible shoulder blocks enlarge the ground contact surface. Both lead to high grip when cornering on wet and dry roads..